Black Mountain is located in the Burrowa Pine National Park and has an access trail all the way to the summit, which makes it a relatively easy one to activate. Having acquired a new FT817 and given it a test airing, I wanted to give the little radio its first proper SOTA outing and so, having spent a bit of time studying maps, Black Mountain became my next SOTA destination. Access to Black Mountain is via the National Park entrance off Jephcott Jewell Road, which is off the Murray Valley Highway about 45km east of Tallangatta. There are no signs or other indications that the National Park is at the end of that road, you just have to trust the map. At the end of Jephcott Jewell Rd the trail forks left into a farm and straight on towards the Park, and at this point there is a brown National Park sign pointing the way. Follow this over a narrow bridge and the “Black Mountain Trail” sign confirms that you are on the right road. The Black Mountain Trail is well graded and not too steep, and so poses no problems for a regular 2WD car or AWD. Only the last 2-300m at the very top require a 4WD. When my lady and I drove up there to activate the Summit we found numerous trees and bits of trees down across the trail. Fortunately none of these were big enough to stop us and all but one of them could be cleared simply by dragging them off the road. One needed some attention with the bow saw but even that one didn’t warrant starting up the chainsaw. About 2-300m below the summit there’s a sign: “4 Wheel Drive”. This is sound advice. If you’re not driving a 4WD, leave your vehicle at this point and walk the rest of the way up. 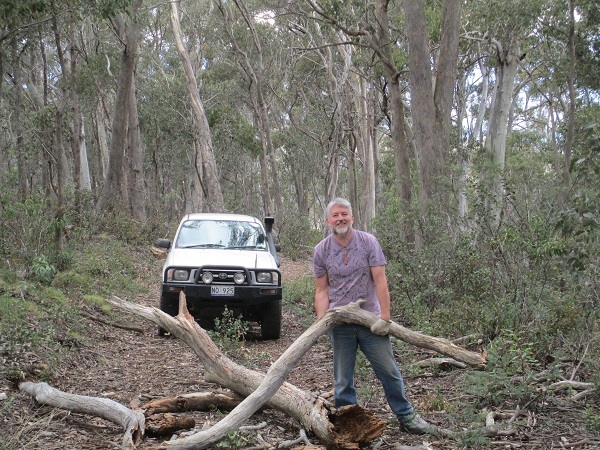 If you are driving a 4WD, it’s steep and the surface is a little loose but you won’t need low range. Drive on and park at the start of the Black Mountain Walking Trail, which is signposted. More on that trail in a moment. Leaving the walking trail on your right, the Summmit is about 100m further on and is signposted so you’ll know when you’ve found it. There are plenty of trees to hang antennas from and so squid poles etc are unnecessary on this one. I lobbed a line over a handy branch, pulled up the link dipole and set my portable shack up so that I could sit comfortably while operating the radio. To my delight I discovered that the FT817 is a perfect fit into the pocket that’s built in to the arm of my folding chair, so I can slip the radio in there without worrying about it falling to the ground or getting its sockets full of dirt. Thank you Mr Coleman! Band conditions were very lively and in short order I worked VK3ZPF/P, VK3CAT, VK3PF, VK3OHM, VK3ANL, VK3FPSR, VK2DAG, VK3BYD, VK3MCD and VK3AMB on 7MHz. With no further takers, my lady and I went for a wander around the summit and checked out the Black Mountain Walking Trail. This goes 2.5km to Hinces Saddle and from there it’s a further 4km or so to Mount Burrowa, which is also a SOTA Summit. The trail is heavily overgrown and it would be very easy to lose track of it. It’s also very rough underfoot and not suitable for anyone who isn’t very physically fit and used to navigating in the bush. I would not recommend trying to access Mt Burrowa that way, especially as there are other trails that go in that direction. On the way back down we took a short side trip to the Ross Lookout. It’s a short walk from the parking area to the view point, and from it there are spectacular views over Corryong to the Snowy Mountains beyond. I highly recommend this side trip, and don’t forget your camera. It is always good to read other radio blogs and yours is no exception. I always have trouble throwing ropes over tree branches using a rock or stick and inevitably finish up with a tangle. 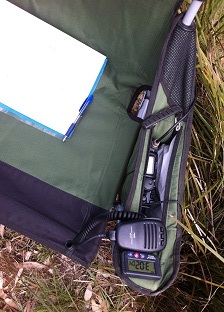 I like the idea of slippery line and the throw bags and I thought the pocket in the chair for the radio is great!